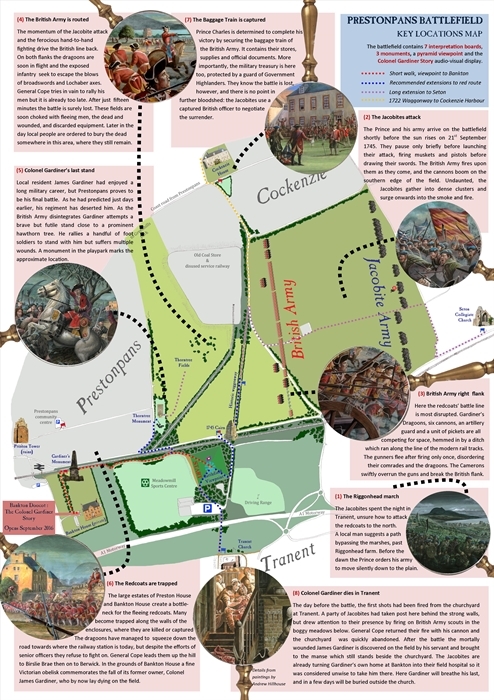 The Battle of Prestonpans took place on 20-21 September 1745, and saw the Jacobite Highlanders of Charles Edward Stuart storm to an unexpected victory over the redcoat soldiers of General Sir John Cope. Starting at the pyramid viewpoint at Meadowmill, giving panoramic views around the battlefield, the visitor can then explore the site of the battle on foot. There are three stone monuments to discover, including the impressive obelisk to Colonel James Gardiner, and a series of interpretation boards. There is also a free mobile App for Apple and Android which guides you around the site, including the 1722 Waggonway Trail. Don't forget to visit the brand new interpretation at Bankton House Doocot, easily accessible from Prestonpans railway station or on foot from the battlefield trail. Here you can take a seat to watch the dramatic 10minute animated short film about the life of Colonel Gardiner, owner of Bankton House and commander of a cavalry regiment in the battle. BY CAR - please park at Meadowmill Sports Centre and continue on foot. Bankton Doocot is an easy 10-15minute walk from the carpark on good paths. BY TRAIN - alight at Prestonpans Railway Station and cross to the south side of tracks; descend the steps and follow the brown signs to the battlefield trail and Bankton Doocot. Access to Bankton Doocot is free, 10am-6pm. Details of how to gain access can be found on the door.